In Cecil B Demille's classic "The Ten Commandments" staring Charlton Heston, Yul Brynner plays the role of Pharaoh Ramesses in one of the all time great Bible movies about Moses. But according to the Bible, Ramesses could not have been the Pharaoh of the Exodus. "Now there arose a new king over Egypt, who did not know Joseph. And he said to his people, "Look, the people of the children of Israel are more and mightier than we; "come, let us deal shrewdly with them, lest they multiply, and it happen, in the event of war, that they also join our enemies and fight against us, and so go up out of the land." "Therefore, they set taskmasters over them to afflict them with their burdens. And they built for Pharaoh supply cities, Pithom and Raamses." The Bible says that the Israelites built Raam-ses, and since Ramesses the second, who ruled between 1290 and 1224 B.C., built a royal city named Pi-Ramesse, many just assume him to be the pharaoh of the Exodus. However recent excavations at this site indicate that this city was occupied much earlier by the Egyptians. The name Raamses itself has also been found inscribed on a burial tomb painting from Pharaoh Amenhotep III; who ruled nearly 100 years before Ramesses II. Although the Bible never specifically identifies the pharaoh of the Exodus by name, it does tell us the exact date of the Exodus. 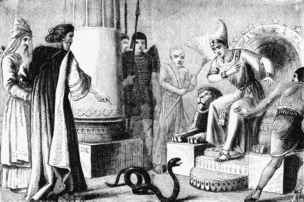 1Kings 6:1 states that Solomon began building the Temple in the fourth year of his reign, 480 years after the Exodus. Most Bible scholars agree that the fourth year of Solomon's reign was 967 B.C. So the date of the Exodus can be calculated: 967 + 480 = 1447 B.C. And according to history, Pharaoh Ramesses did not begin his reign until around 1290 B.C., so he couldn't have been the Exodus pharaoh. Depending upon which history book you read, there are two possible candidates. The first is pharaoh Amenhotep II who may have ruled from (1450-1425 B.C.). He was the son of Thutmose III, who ruled from either (1490-1450) or (1490-1436 B.C. ), the other possible candidate. Scholars disagree as to the exact dates that these two men ruled which makes it difficult to pin point the exact one. 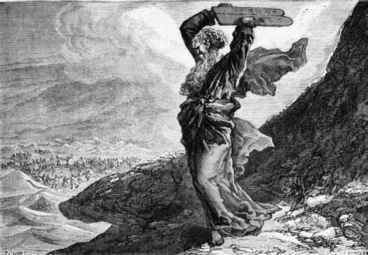 To get some clues, lets look at what the Bible says about the events surrounding the life of Moses. "Moses was eighty years old and Aaron eighty three years old when they spoke to Pharaoh." The fascinating thing about his name is that if you remove THUT from his name you are left with MOSE. What's the chance of this being just a coincidence? According to the Bible, in Exodus 1:22-2:10, this Pharaoh gave the command that every son who was born of the Hebrews should be cast into the river. So fearing the child's life, the mother of Moses hid him in a basket in the reeds along the bank of the Nile. While Pharaoh's daughter was walking along the riverside she found him and raised him as her son. "Pharaoh's daughter, Thermuthis, was walking along the river bank. Seeing a basket floating by, she called to her swimmers to retrieve it for her. When her servants came back with the basket, she was overjoyed to see the beautiful little infant inside . . .
Thermuthis gave him the name Moses, which in Egyptian means "saved from the water" . . . Having no children of her own, she adopted him as her own son." Josephus says that the name of pharaoh's daughter was Thermuthis, which sounds an awful lot like the royal name Thutmose or Thutmosis. According to history, Pharaoh Thutmose and his wife, Queen Ahmose, had two daughters, Neferubity, of whom little is known, and Hatshepsut who later became Queen and bore the title 'Kings daughter'. Hatshepsut married her stepbrother Thutmose II as arranged by her father. After her father's death, her husband Thutmo-se II became pharaoh, but Hatshepsut was really in power. Queen Thutmose II if you will. She became one of Egypt's greatest rulers. She coreigned with her husband from approximately 1504-1490 B.C. "Moses fled and became a dweller in the land of Midian, where he had two sons. And when forty years had passed, an Angel of the Lord appeared to him in a flame of fire in a bush, in the wilderness of Mount Sinai." Subtracting 40 years from the date of Moses birth in 1527 B.C. equals 1487 B.C., the date at which he flees Egypt. Either Thutmose II or Thutmose III would have been in power around this time. Since historians are not sure on the exact dates for their reign, lets go through the two possibilities. 1) THUTMOSE III - EXODUS PHARAOH? If Thutmose II was the Pharaoh from whom Moses fled, Thutmose III may have been the Pharaoh of the Exodus. The Jewish historian Josephus wrote the following: "The Pharaoh, from whom Moses had fled, died, and a new Pharaoh had become ruler." After the death of Thutmose II, his son, not by Hatshepsut, became pharaoh. Thutmose III co-reigned with Queen Hatshepsut until her death in 1482 B.C. He then ruled alone until approximately 1450 B.C. It is also known that Thutmose III was so jealous of the acts done by Queen Hatshepsut that one of his first acts, after her death, was to purge her name off of all monuments in Egypt. Another interesting thing recorded in history about Thutmose III was that he was the greatest conqueror in Egyptian history, he was known as the Napoleon of ancient Egypt. During his reign he had recorded that he subdued the Ethiopians.
" A state of war broke out between the Egyptians and the Ethiopians. At this time Moses had grown to be a man. The two sides fought a great battle in which the Ethiopians were triumphant, and they pushed to conquer all of Egypt. 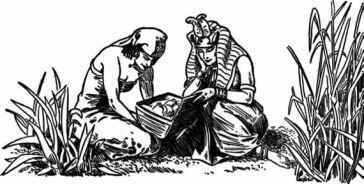 The Egyptians looking for help inquired of their priests. The priests revealed to them that they should make Moses their general . . . Moses then became the commander of a great army . . . In a surprise attack against the Ethiopians, Moses led his troops to victory." It may be that Thutmose III, being jealous, took credit for victories over the Ethiopians, even though Moses achieved them. "Because of the bravery of Moses, The daughter of the king of Ethiopia, Tharbis, saw Moses and fell madly in love with him. She sent to him a delegation of her most trusted servants to propose marriage. He accepted, on the condition that she would surrender the city over to him . . . After Moses had punished the Ethiopians, he praised God and then celebrated his marriage." The Bible also mentions his Ethiopian wife in Numbers12:1: "Then Miriam and Aaron spoke against Moses because of the Ethiopian woman whom he had married; for he had married an Ethiopian woman." Josephus also writes: "The Pharaoh, from whom Moses had fled, died, and a new Pharaoh had become ruler. Moses traveled to his palace and told him of the victories he gained for Egypt in the war against Ethiopia . . . He also spoke to Pharaoh about what had taken place on Mount Sinai, and when Pharaoh laughed, Moses showed him the signs." "So the Egyptians pursued them, all the horses and chariots of Pharaoh, his horsemen and his army, and overtook them . . .
"To him who divided the Red Sea asunder, and brought Israel in the midst of it, but swept Pharaoh and his army into the Red Sea." This passage indicates that Pharaoh was killed in the incident. If so, the date of the Exodus in 1447 B.C., as calculated from the Bible, is synonymous with Pharaoh Thutmose III death which most historians approximate at 1450 B.C. If indeed Thutmose III was the Pharaoh of the Exodus, his acts recorded in history would have been consistent with how the Bible portrays him as personally leading his army against the Israelites. "Then the king moved to the front of his army . . . Where his majesty [Thutmose III] triumphed over them as leader of his troops." Some people don't believe that the Pharaoh perished in the waters of the Red Sea because the tombs of both Pharaoh Thutmose III and his successor, Amenhotep II, have been found. But if one reads Exodus 14:30 carefully it states the following: "So the LORD saved Israel that day out of the hand of the Egyptians, and Israel saw the Egyptians dead on the seashore." This passage indicates that the dead bodies of the Egyptians were deposited on the shore of the Red Sea. This would have allowed the Egyptians access to his body for burial. 2) AMENHOTEP II - EXODUS PHARAOH? If Moses fled from Thutmose III, the Exodus pharaoh would have been his son, Amenhotep II. "Then you shall say to Pharaoh, 'Thus says the LORD: "Israel is My son, My firstborn. "So I say to you, let My son go that he may serve Me. But if you refuse to let him go, indeed I will kill your son, your firstborn." "By faith Moses, when he became of age, refused to be called the son of Pharaoh's daughter, choosing rather to suffer affliction with the people of God than to enjoy the passing pleasures of sin, esteeming the reproach of Christ greater riches than the treasures in Egypt; for he looked to the reward. By faith he forsook Egypt, not fearing the wrath of the king; for he endured as seeing Him who is invisible." HUMBLE YOURSELF BEFORE THE LORD AND HE WILL LIFT YOU UP! "Now the man Moses was very humble, more than all men who were on the face of the earth." In the country of Jordan, at an excavation site known as Deir 'Alla, a fragment of a text from the prophet Balaam was found which dates to at least 800 years before Christ. The discovery consists of 119 broken plaster fragments inscribed with an ancient text written in the Aramaic language. One of the fragments is inscribed with the words "Warnings given by Balaam, the son of Beor. A seer of the gods." Also included in the text is the Aramaic word "Shadday," which translated into English is "the Almighty." This is consistent with Balaam's oracles given in the Old Testament. The present day country of Jordan where the inscription was found, was known as Moab at the time of Balaam. This backs up the biblical account found in Numbers 22-24, in which the King of Moab sends the elders of Midian before Balaam and offers him money to curse the children of Israel. 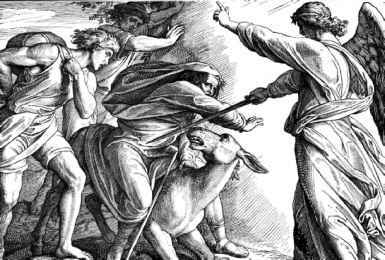 Instead of cursing the children of Israel, the spirit of God came upon Balaam and he blessed them. "Now Israel remained in Acacia Grove, and the people began to commit harlotry with the women of Moab. So Israel was joined to Baal of Peor, and the anger of the LORD was aroused against Israel . . . And those who died in the plague were twenty-four thousand." "Look, these women caused the children of Israel, through the counsel of Balaam, to trespass against the LORD in the incident of Peor, and there was a plague among the congregation of the LORD." The reason for God's great anger against Israel is recorded in Psalm 106:28: "They joined themselves to Baal of Peor, and ate sacrifices made to the dead." Though it is only speculation, their sins may have also involved child sacrifice for both Jeremiah 19:5 and Jeremiah 32:35 mention that this was a common practice in Baal worship and we know from Deuteronomy 12:30-31 that it was performed by the pagan nations at this time. 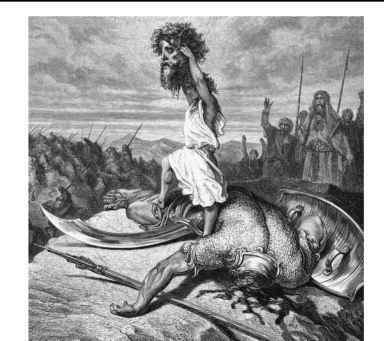 God thus commanded Moses to battle the Midianites as vengeance for such abominations caused by the plan of Balaam. "But I have a few things against you, because you have there those who hold the doctrine of Balaam, who taught Balak to put a stumbling block before the children of Israel, to eat things sacrificed to idols, and to commit sexual immorality." "A Star shall come out of Jacob; A Scepter shall rise out of Israel, And batter the brow of Moab, And destroy all the sons of tumult . . . Out of Jacob One shall have dominion." Why did the ethiopians war with thutmose 2 for ten years? Can i have access to body pharaoh in Egypt?